Di bawah ini merupakan penjelasan mengenai penggunaan preposisi during, from, out of, dan by, lengkap dengan contoh kalimat dan latihan soalnya. Preposisi ini biasanya diikuti oleh sebuah Noun (kata benda) yang mengindikasikan waktu. During digunakan untuk menggambarkan durasi dari waktu, bisa diartikan selama, selagi, atau pada waktu. During our vacation, we visited many relatives across the country. During the summer, we do not have to study. Preposisi ini merupakan kebalikan dari preposisi to. Contoh: He came from Miami last night. adalah kebalikan dari He went to Miami. He lived in France from 1972 to 1978. We drove from Atlanta to New York today. Expresi form yang umum digunakan. We visit the art museum from time to time. 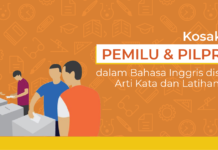 Preposisi ini merupakan kebalikan dari preposisi into, dan biasa diartikan kehabisan, tidak ada, rusak, keluar. Emily went to the store because she was out of milk. Mr. Clark cannot see you this week because he is out of town. Don’t use that dictionary. It’s out of date. Elleanor has been very unhappy since she has been out of work. Your request for the extension of credit is out of question. My watch is out of order. Preposisi ini bermakna to go past a place (melewati suatu tempat) atau to be near a place ( di dekat suatu tempat). Laskar Pelangi was written by Andrea Hirata. by + specific time (before). We usually eat supper by six o’clock in the evening. We travel to Jakarta by train. I will graduate from the university in 2019. By then, I hope to have found a job. We are driving to Jakarta by way of Bandung. By the way, I’ve got two tickets for Saturday’s game. Would you like to go with me? This book by far the best on the subject. Nobody will receive a check on Friday because the wrong cards were put into the computer by accident. 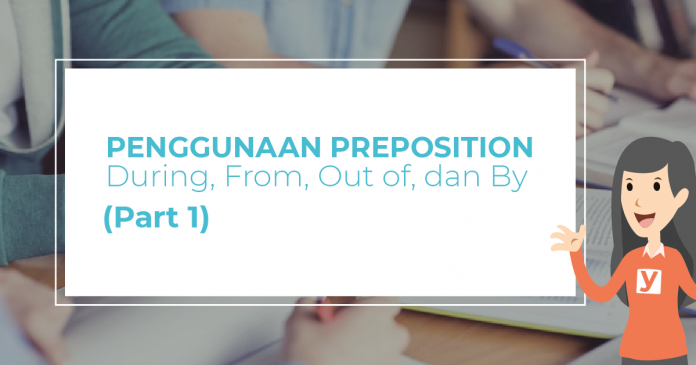 Sudah jelas kan penggunaan dari preposisi during, from, out of, dan by? 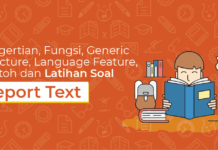 Sekarang untuk lebih memahami materi ini kerjakan latihan soal di bawah ini. Lengkapilah kalimat rumpang di bawah ini dengan memilih salah satu jawaban yang paling tepat. 1. She smacked her books down on the table and stormed ________ the room. 2. You should sit on the waiting room ________ the registration process. 3. A lot of English words come _______ Latin. 4. We had to use our neighbor’s telephone because ours was ________ . 5. We walked _______ the hotel to the station. 6. I think it’s __________ to go hiking in rainy season. 7. Yohannes is riding his motorbike to Atlanta ________ Baton Rouge. 8. This article is ________ the best on the subject. 9. Ethan usually goes to school _______ seven o’clock in the morning. 10. Have you read any books _____ Charles Dickens?